You don’t have to be a beekeeper to help honey bees and native pollinators. You can simply change a few habits around your yard. A well manicured lawn of rich green grass, beauty bark, and a few flowers may look nice to you, but from a bee’s perspective it is a desert with little food or nutrition. Franclyn Heineke, a Washington State Master Beekeeper, has put together this brochure to tell you more. As you plan your garden, try creating a better habitat for bees and native pollinators. You’ll have healthier plants and more fruits and vegetables. Add more native plants that thrive in our area. Native plants will be more hardy and require less maintenance. Plant more fruits, vegetables, and herbs. In addition to giving you food, they provide pollen and nectar. Diversify your plants to bloom at different times of the year. Provide a source of nectar and pollen all season long. 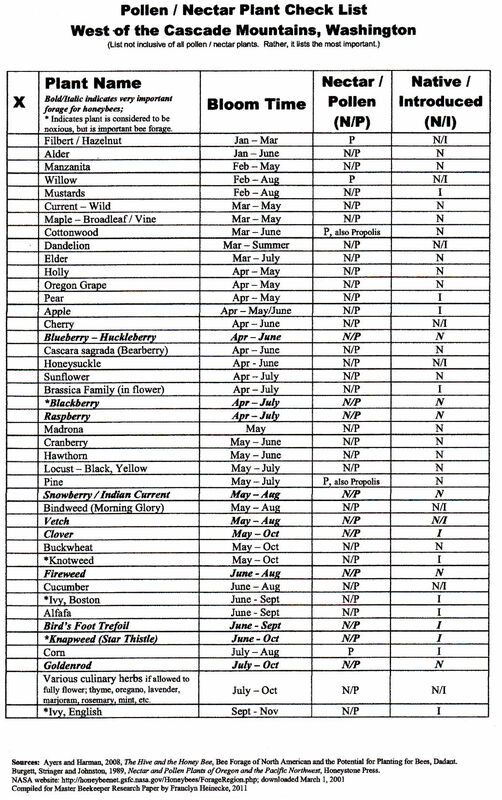 For a list of Northwest plants and their benefits to pollinators, download our Pollen/Nectar Plant Check List: Forage West of the Cascades (.pdf). Honeybees live as a colony all year long. They do not hibernate. When the weather is bad and flowers aren’t blooming, they live inside the hive eating stored food. They eat honey for carbohydrates and pollen for protein. A colony needs about 70 pounds of stored honey to live from November to March in the Pacific NW. To store that much food, in addition to the hundreds of pounds of honey they eat all year long, bees need to find high quality nectar and pollen sources from March to October when most flowers are blooming. 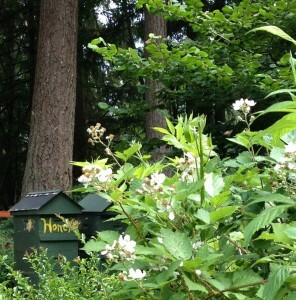 Blackberry nectar and pollen is the most important food for honeybees in Western Washington. It provides the most nectar, allowing bees to store food for the winter and perhaps providing some excess honey for beekeepers to harvest. 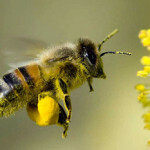 Blackberry nectar and pollen also has been found to contain extremely high levels of important nutrients needed to keep honeybees healthy and help the colony deal with pests, pathogens, bacteria and disease. Considered a Class C noxious weed, control for blackberry is decided at the local level. It can be cut back and managed rather than eliminated completely. For the sake of all our bees, please keep and control some blackberry rather than removing it. When controlling plants that you consider to be “weeds”, please consider hand removal before spraying. Many sprays may be listed as “safe for bees” but research has shown that herbicide and pesticide residues build up in the wax of honeycomb and can become toxic to the colony within three to five years. Those chemicals drift to the hive during application and also are brought to the hive when bees visit plants and flowers that have been sprayed. Use the lowest dosage and least amount of chemical needed. Do not over spray. Do not apply sprays when flowers are in bloom. Spray early in the morning or late in the evening when there is less wind. If the plants you remove are an important food for bees, such as blackberry, please consider replacing that food. Many seed supply companies provide seed blends for pollinators. Anise, Asters, Black-eyed Susan, Borage, Catnip, Clover, Coreopsis, Coriander/Cilantro, Cornflower, Corn Poppy, Cosmos, Forget-me-not, Hyssop, Lemon Balm, Mints, Mustards, Kale, Phacelia, Sedum. Herbs that fully flower are a powerhouse of important nutrients for honeybees and many other pollinators. Include these plants in your garden and let them fully flower. You will be amazed at the number of pollinators that visit: thyme, oregano, lavender, basil, mint, coriander/cilantro, sage (especially Russian), and other culinary herbs. It may be hard if not impossible to completely avoid pesticides. There are some pests that do quite a bit of damage to our gardens. But we can be smarter about how we use pesticides. 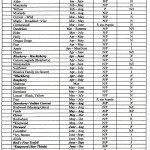 Avoid “broad spectrum” pesticides. These will indiscriminately kill everything they come into contact with. Use targeted pesticides. If you feel you absolutely have to use a pesticide, use one the selectively focuses on your specific problem you are trying to solve. Apply pesticides wisely. It’s best to apply them in the early morning or late evening when bees and other beneficial insects are not active so they can avoid getting hit with direct exposure. Use natural predators. The best way to eliminate pests is to encourage or introduce natural predators. One example is the lady bug that will eat aphids, mites, white flies, and scale insects. Go for balance in you garden. A healthy garden will have an entire ecosystem of critters that keep things under control. What chemicals are specifically bad for bees? Read more from the Xerces Society, a leading nonprofit organization focused on conservation of invertebrates and their habitat.